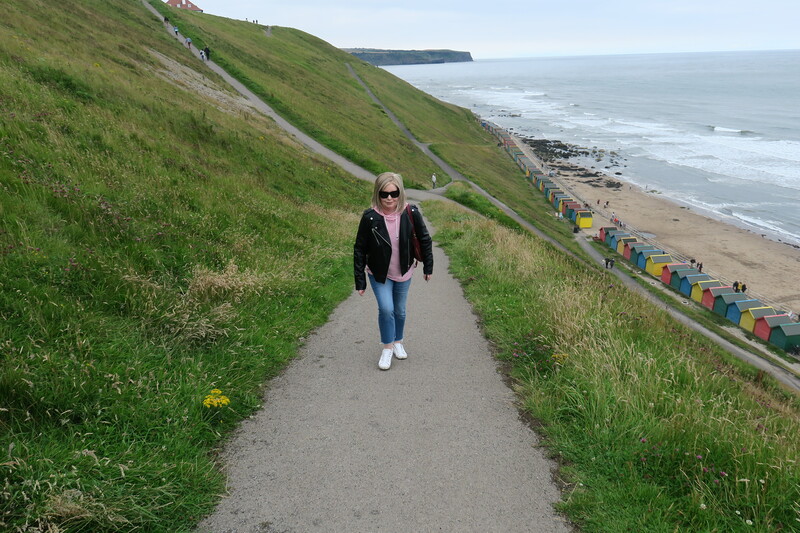 Our plan for the rest of the day in Whitby was just to wander and go where the fancy took us. The old town area is possibly my favourite part. 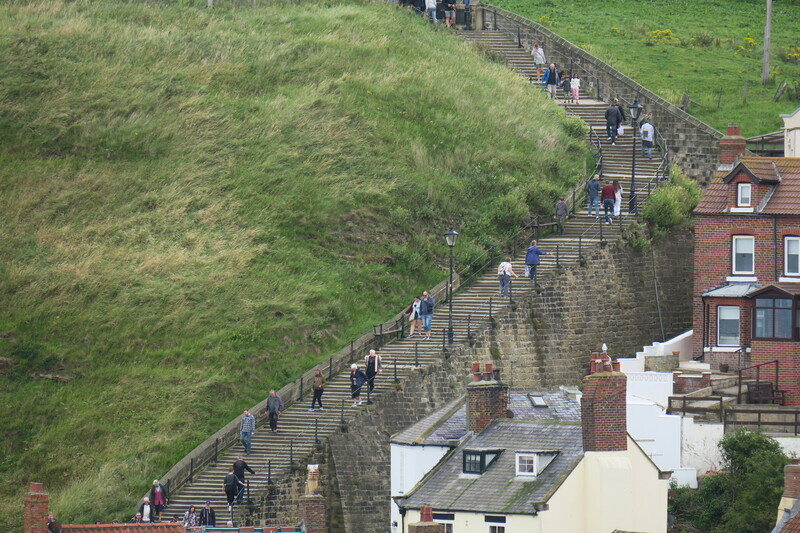 Clustered around the 199 steps are a maze of narrow cobbled streets, tiny alleyways and loads of shops selling black jet jewellery, a minor gemstone found locally and made famous by Queen Victoria. She wore it as part of her mourning dress. Lots of interesting and independent shops, some art galleries and many eateries meant I could have stayed here all day. 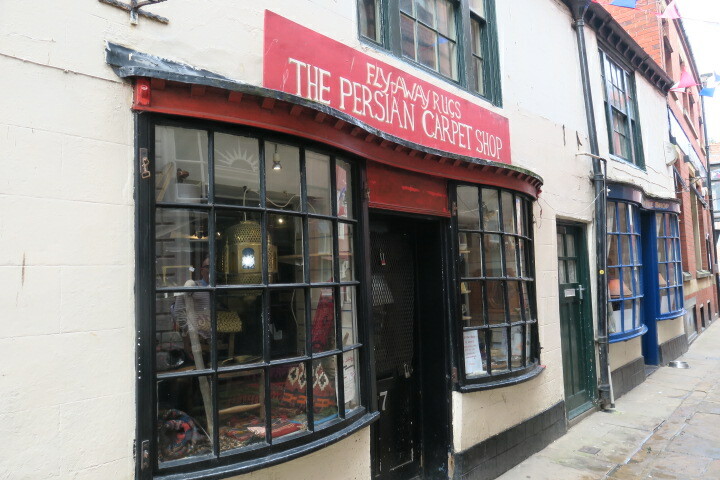 I loved the alleyways too – you never quite know what you’re going to find and where they lead. One or two took us to the beach. 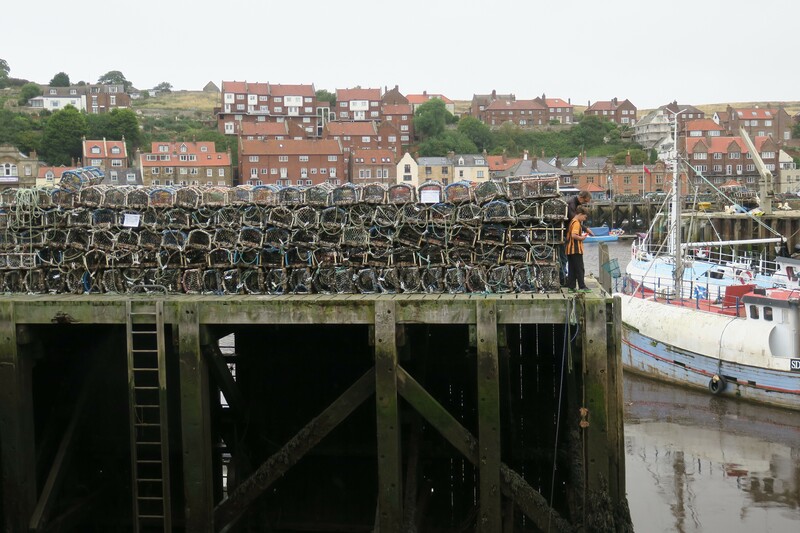 The working harbour is busy and bustling with so much to watch. I seemed to have developed some sort of a mild obsession with lobster pots, more than a few photos in my collection now. Plenty of pleasure craft too although on a windy day the trips around the harbour and out to sea didn’t look like much fun to me. 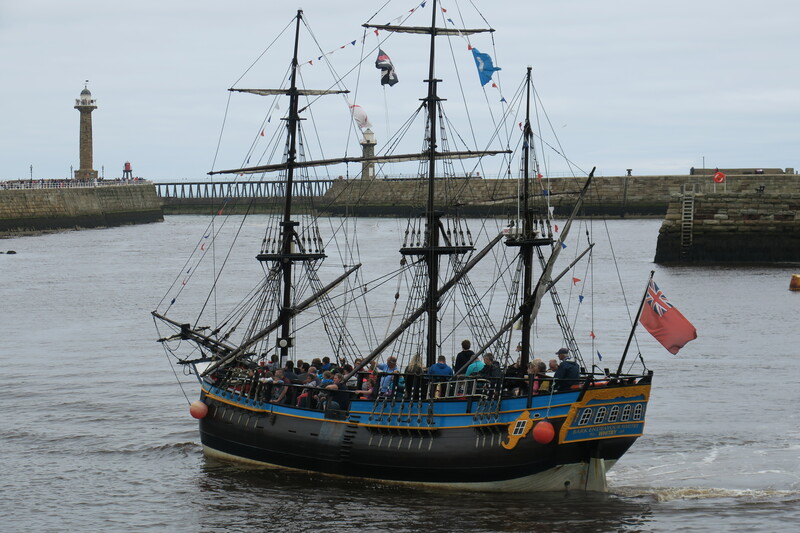 We watched a galleon replica of Captain Cook’s ship heading out with sea shanties playing. Maybe that was to help take the passengers’ minds off the rocking – it looked like a very rough 20 minute ride. There is a little pier, we strolled along it but big gaps in the wood and the foaming sea below made my knees knock more than a bit. 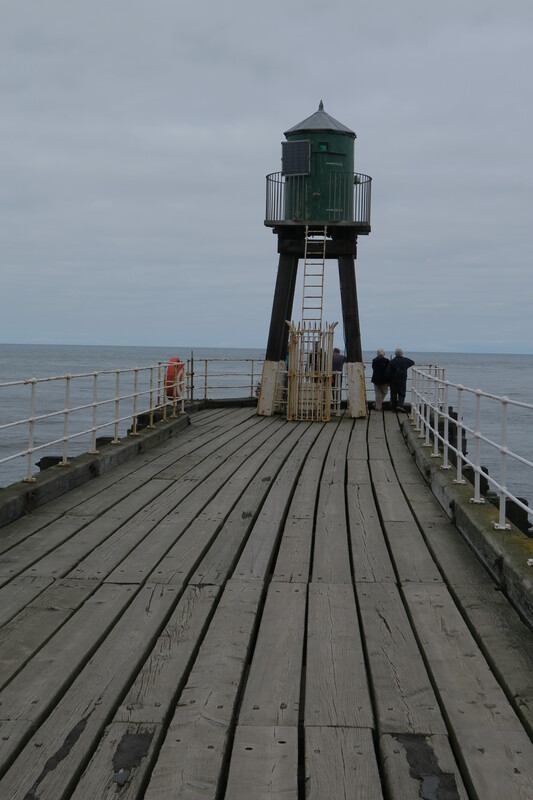 Normally I love nothing more than a walk along the pier, here not so much…. Some great views across to the Abbey but even that wasn’t enough to distract me. 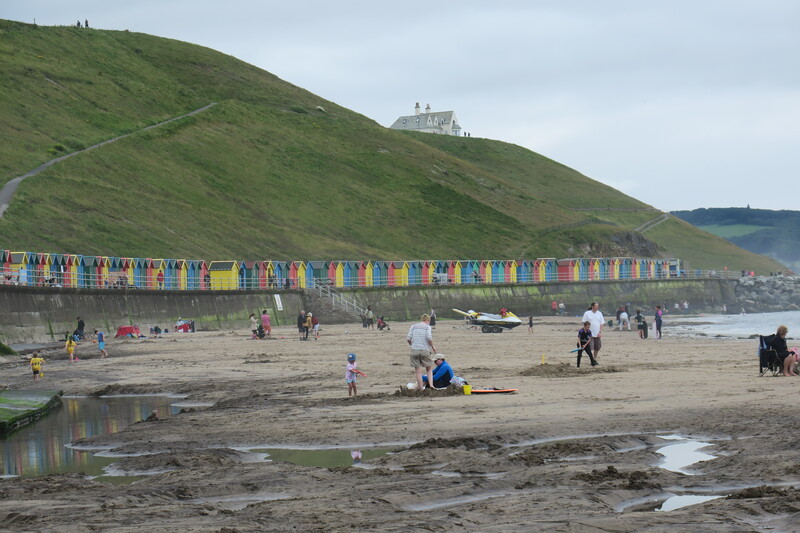 Despite the less than ideal beach weather there were plenty of families enjoying the sand and sea. 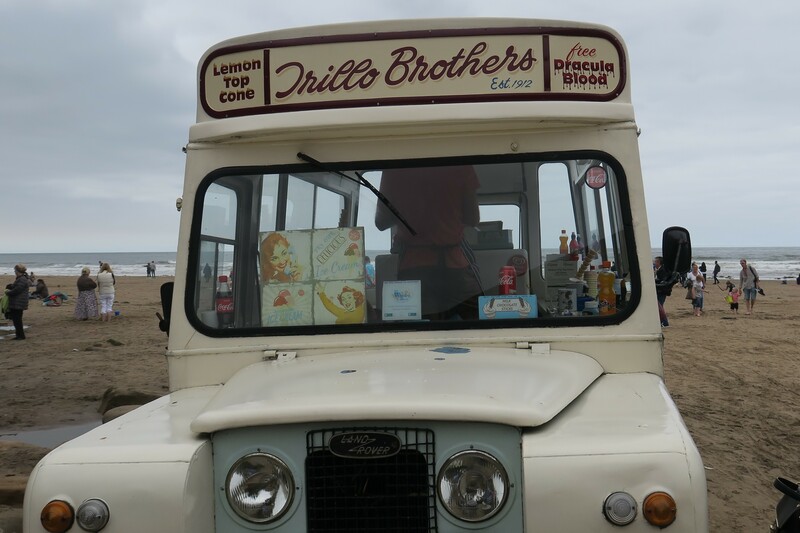 The ice cream seller on the beach was making the most of that Dracula connection too. 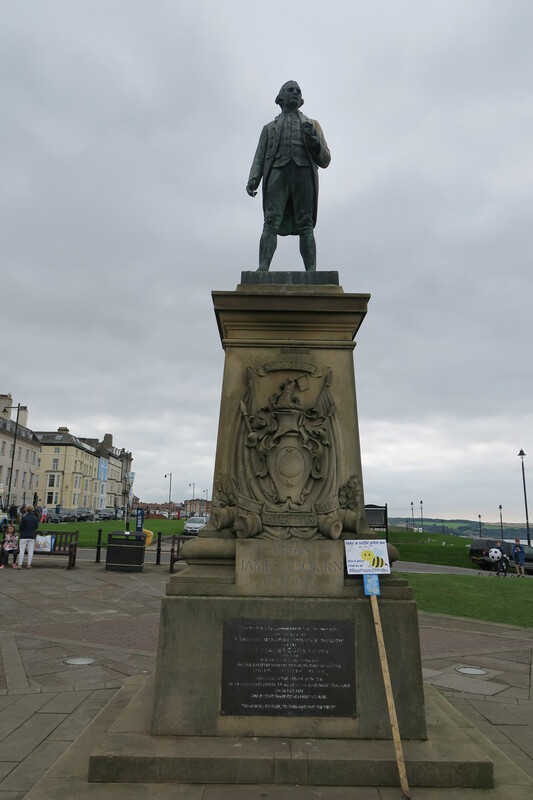 We found Captain Cook’s statue right at the top. 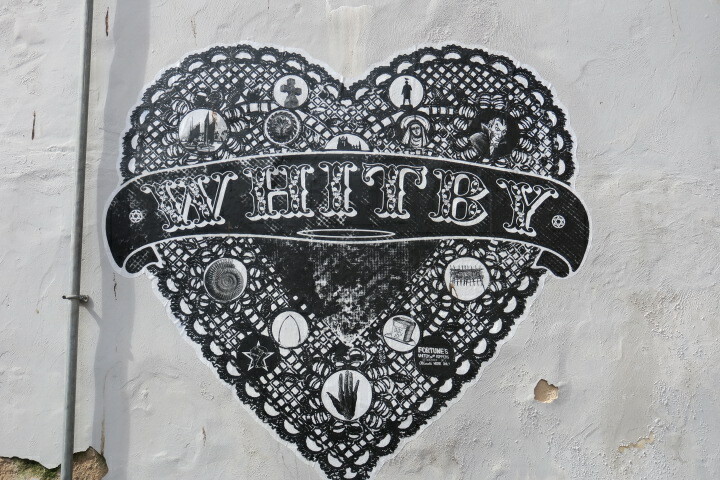 He has a strong connection with Whitby having learned his craft here. Two of his ships were built in Whitby and unfortunately we ran out of time to visit the museum dedicated to the famed explorer. 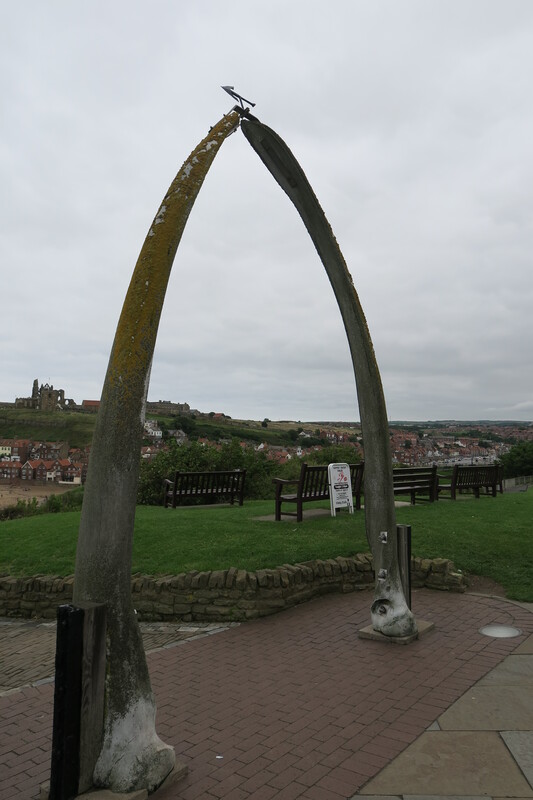 The original Whale Bone arch nearby was erected in 1853, a replica was presented by Norway in 1963 and this one was given to Whitby by Alaska in 2003. Great views of the Abbey and those steps from here too. We walked past a whole series of amusement arcades (one of the benefits of Son not being with us was being able to walk past). 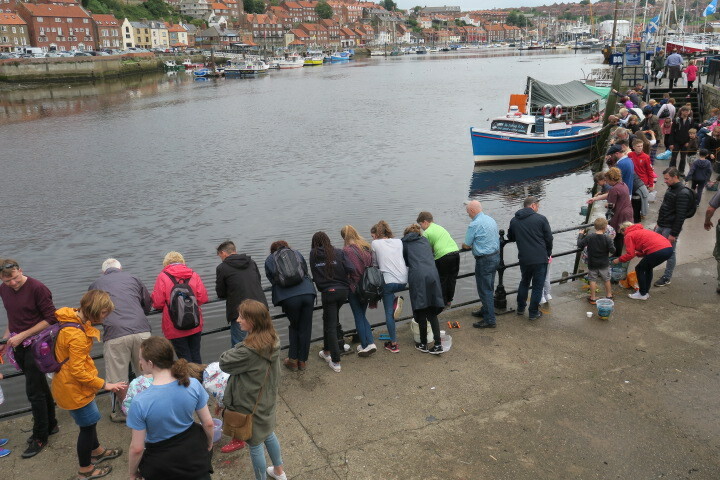 Back past the harbour where we saw a multitude of people crabbing, then back to the car with tired and aching limbs (my phone logged 25,000 steps and 70 storeys that day), a successful return visit to Whitby. Love the colorful beach huts! As always, your post was so interesting. Thanks for sharing. Thank you Sue!! I loved those beach huts too. Ah yes, shivering on the beach with a grey sea! Shades of my childhood…. Me for the cliff lift! Mine too!! Bone of contention that cliff lift – I would have jumped in for sure, my husband had a lot to listen to when I realised he knew about it after walking up the cliff! This looks very pretty! 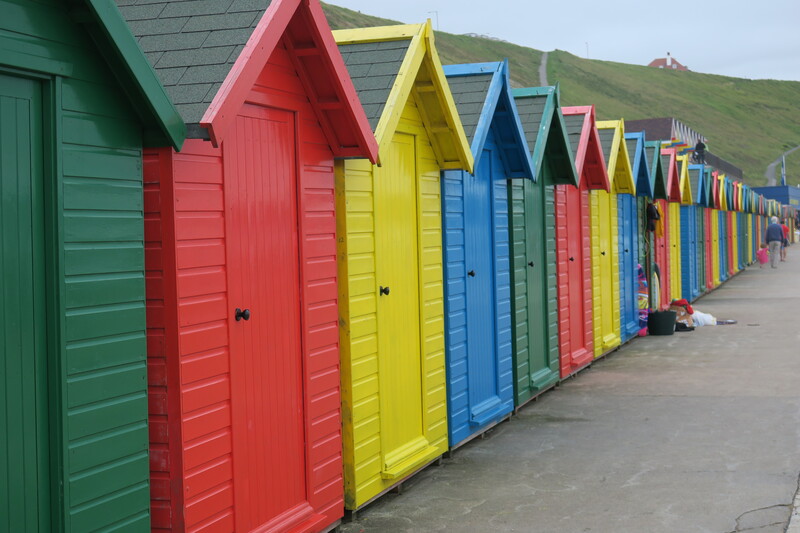 I love the colourful beach huts. I loved them too, they look stunning from all directions! Like you, I enjoy the charm of old towns. Interesting the shape of the lobster pots which are a bit different from the ones I’m used to seeing. I guess they all work the same. The old town here was just gorgeous and perfect for wandering. 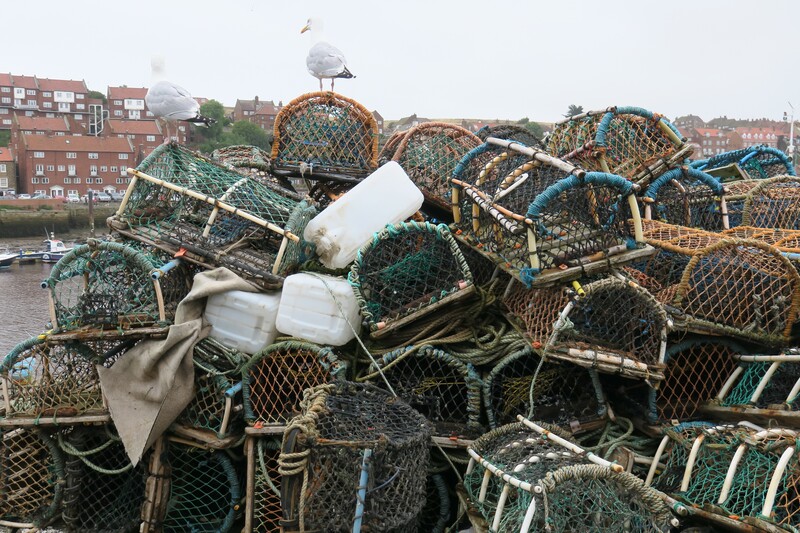 Interesting to know there are different looking lobster pots too! 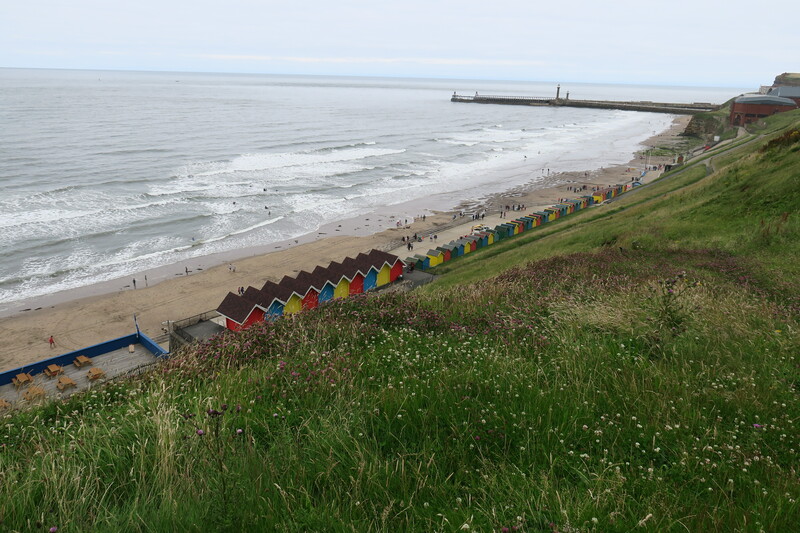 A lovely post on Whitby bringing back lots of fond memories. 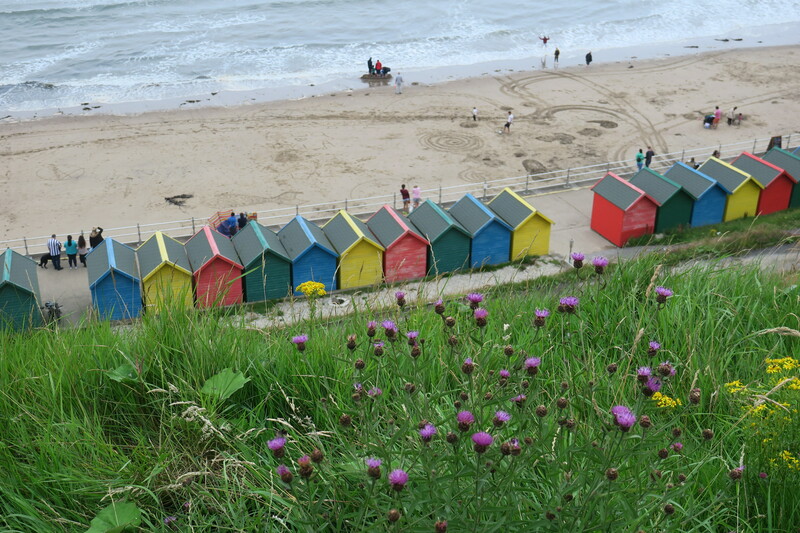 I just love the brightly painted beach huts too. 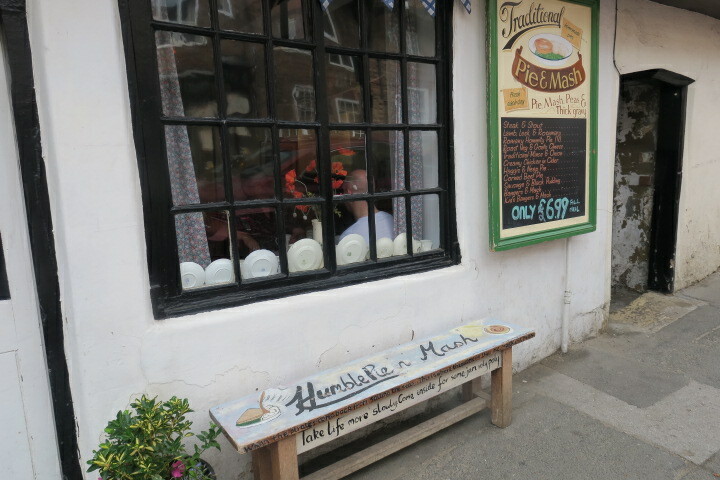 When we were there we had fish and chips at the Magpie Cafe did you perhaps see it, it used to always gave long queues outside but as I’ve not been for a long time, I’m not sure f it is still so popular or still there. Marion. My friend recommended the Magpie Cafe to us Marion and we did seek it out but it was shut unfortunately. They had a fire around May bank holiday I think but are open again now – we’ll have to go back sometime!! Oh that was a shame, anyway it’s a good excuse to return as the fish and chips were delicious! Wow, that place looks amazing. It just made it on my wish list to be visited one day. It is gorgeous and definitely worth visiting Cecilia! Great post, who needs the gymnasium, just walk like that all the time. You’ll need a day off from all the exercise you’ve been doing. Absolutely Terry, I have to say my legs did ache that night and I slept very well!! 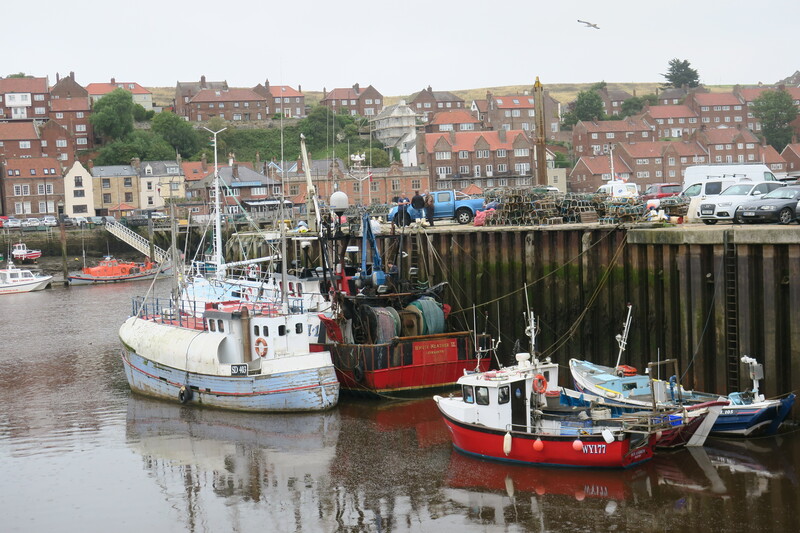 Fish and chips in Whitby was always a family tradition Joy! Lovely photos – I always loved the old town and cobbled streets too. Plus I love the lobster pot collections! No change here – we remain on hold. It is very hard but have many things here to keep me going and just trying to get on with things hard though that is. Once anything changes I’ll make arrangements to come over. Hope all is well with you and I have been especially enjoying your north Yorkshire posts – they have such happy family memories for me! Such a difficult time for you Rosemary, you must feel very helpless. I think it’s true though, you have to keep busy and keep going hard though that is. Still thinking about you and sending you best wishes. Sad news Joy – my mum passed peacefully away late last night UK (early morning here). Very emotional time but thankful that Mum is now at peace (she suffered for many years with dementia). Mum lived most of her long life in Yorkshire so your posts have been a lovely reminder of happier times. I love lemon top cones, though I’ve only ever seen them offered in Whitby. I wonder why? I would definitely have gone for the free Dracula blood! 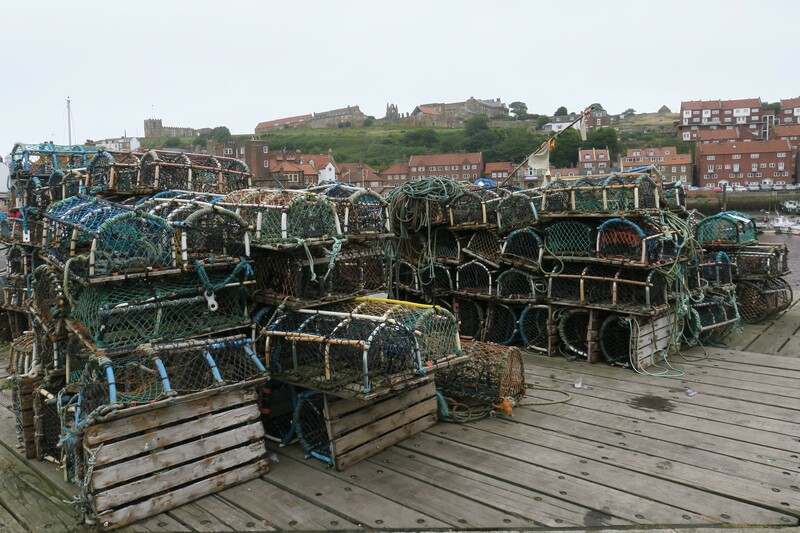 Love all your photos, even the lobster pot ones, despite my fear of lobsters (I think it helps that you can’t really see any lobsters in them). There were no lobsters around at all!! You would have been fine here Jessica! So much nautical and maritime history here. Sounds fascinating. It is the kind of place you could mooch around for ages and never get bored, there is so much to see and do. They have some museums we didn’t get the chance to visit but I would love to go back. Such a charming place, Joy! I love the beach huts! I am a sucker for beach huts Pam – can’t stop taking pictures of them!! 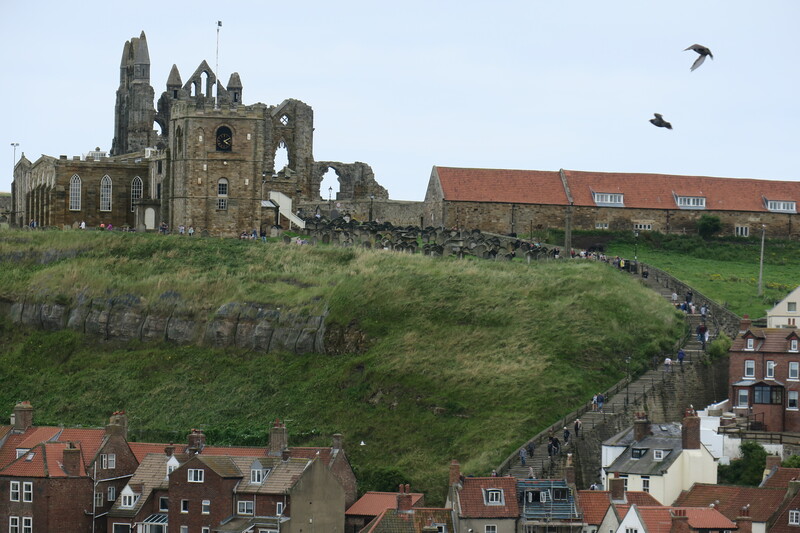 I’ve had a brief visit to the Abbey before but looks like there’s a lot more to Whitby than that. Will have to go back sometime. Fancy walking up the cliff and then announcing there was a lift – that’s the sort of thing I’d do 🙂 ! This looks like the perfect little seaside town! 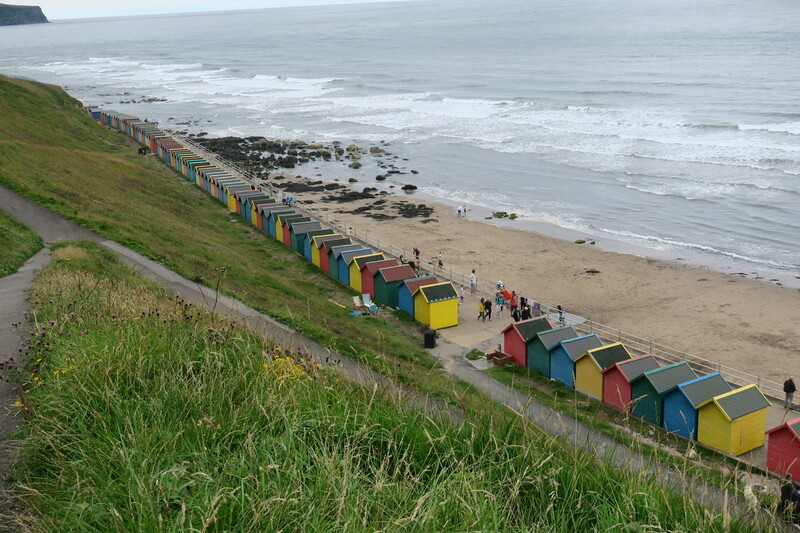 Love the colorful beach huts! I’m a sucker for beach huts and these ones were gorgeous. 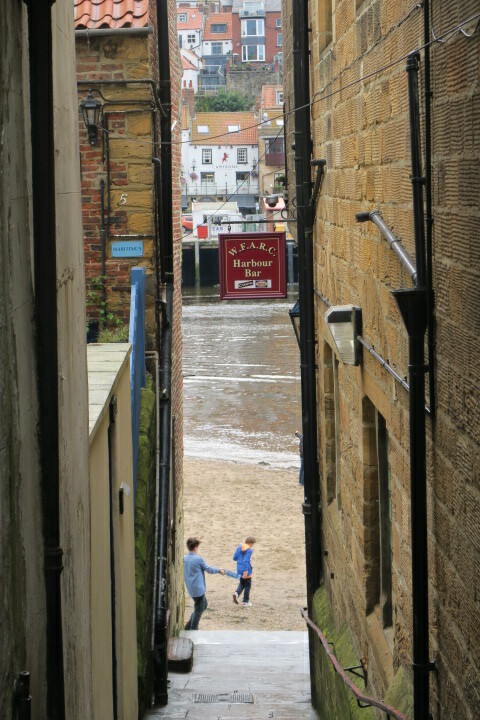 I’d love to go to Whitby sounds like my kind of day! The pier sounds a little rickety and scary! I’m sure it was completely fine but walking along just did weird things to my knees and stomach!!! 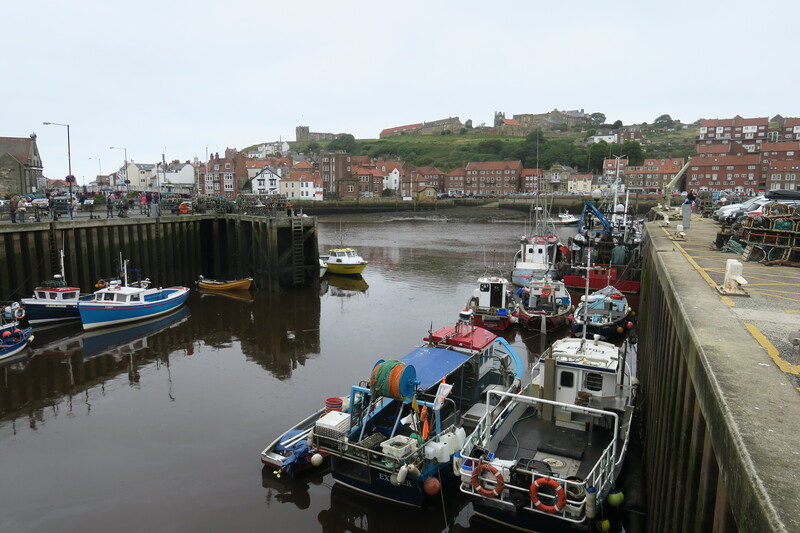 Whitby is great though – definitely recommend a visit if you’re ever in this area. I want some of that Dracula Blood! Just the thing to set off an ice cream in Whitby! All we needed was sunshine!! I did – just a few of many here!! 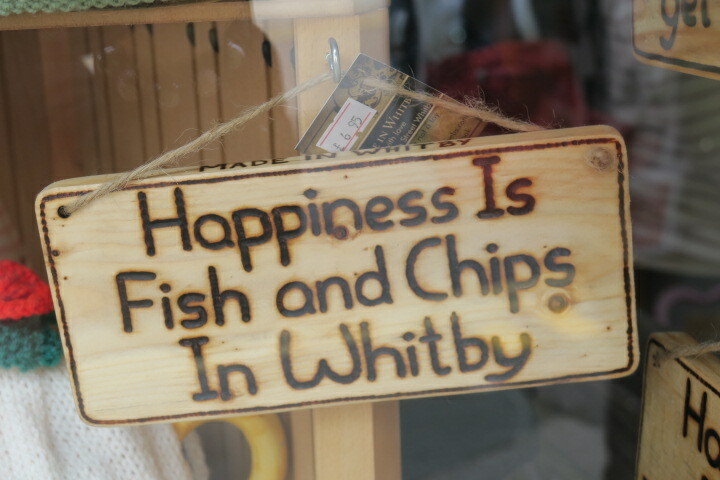 Happiness IS fish and chips from Whitby! What a cute town! We were lucky enough to have friends whose parents have one of those adorable beach huts! Love that spooky cemetery at the top of the hill as well! It is definitely a gorgeous little place and such fun to explore all the nooks and crannies. Wow – having use of a beach hut must have been such a lot of fun. 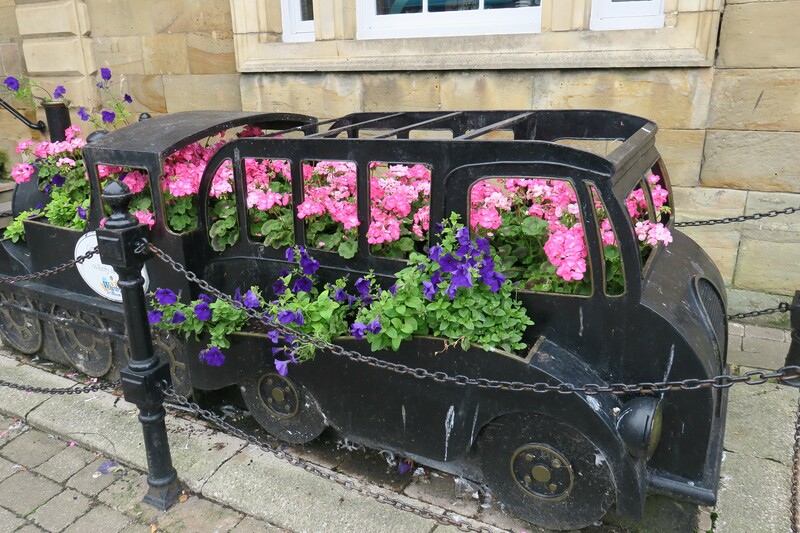 Thanks Kamila – yes it is quirky and different, lovely to explore and walk around. I really enjoy your write-ups, Joy. You have such a nice balance of photos with interesting explanatory background notes. This looks like a lovely place to visit. Thank you so much Reggie!! 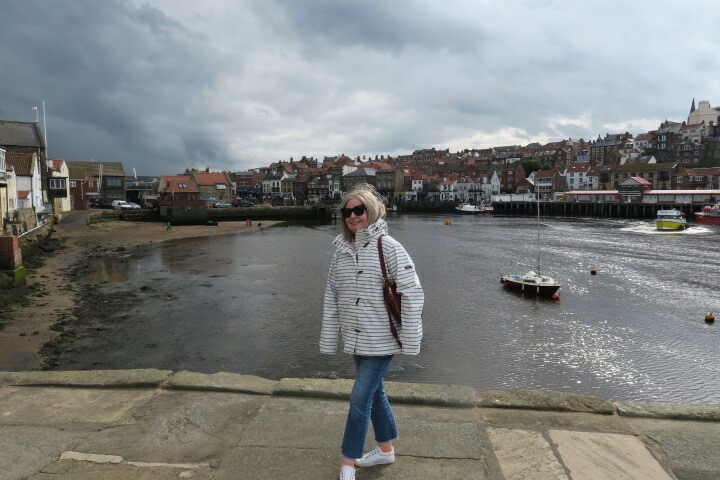 Whitby is so lovely, the Dracula connection, lots of interesting nooks and crannies to explore and a wonderful old Abbey, we had such a great day out there. Such a pretty coastal town! The beach looks like a fun place. Lovely pics as always! 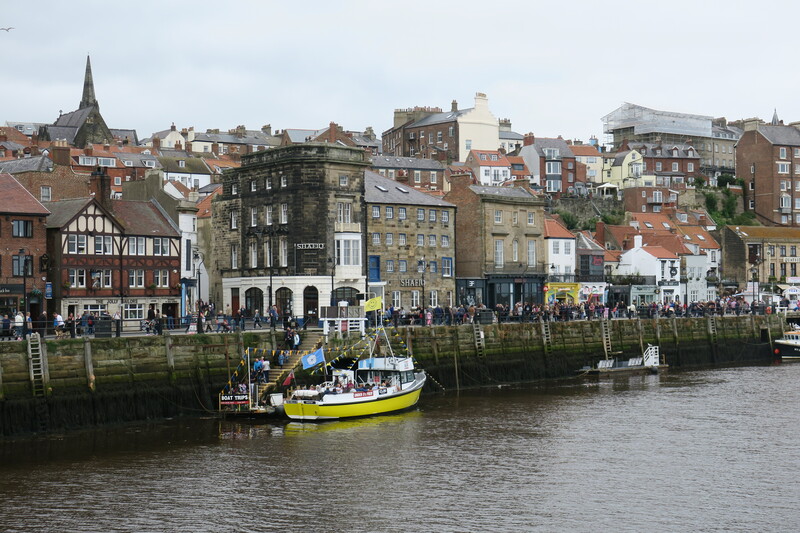 It was a great day out, we loved Whitby. 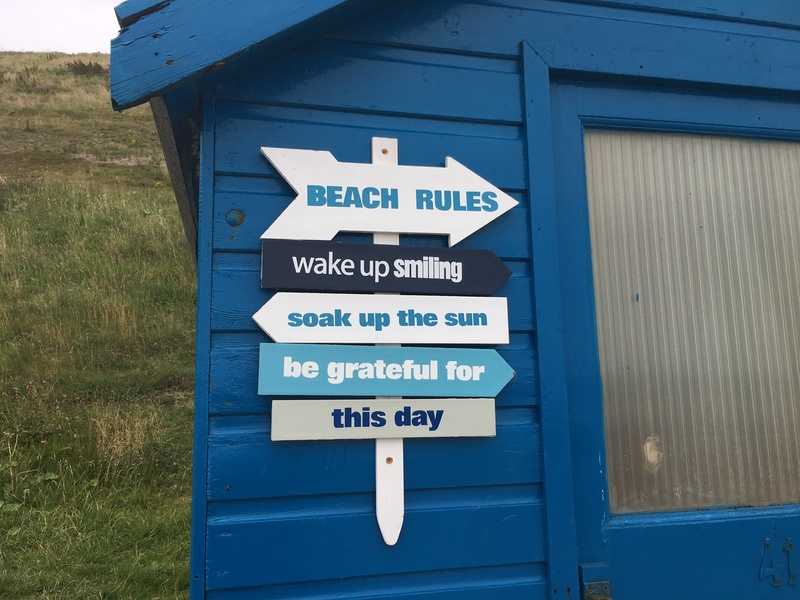 The beach was fun – the only thing to make it better would have been some sunshine! !